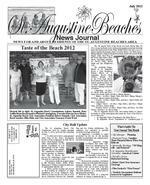 St. Augustine Beaches News Journal July 2012 2 News From Around St. Johns County St. Augustine Crescent Beach ATLANTIC OCEAN St. Augustine Beach St. Augustine Shores PO Box 51593, Jacksonville Beach, FL 32240 Todd Logsdon General Manager (904) 505-0301 Cliff Logsdon Publisher/Editor (270) 537-5304 News Journal St.AugustineBeaches The function of the Beaches News Journal is to serve the Neighborhoods of the St. Augustine Beaches area. First priority will be given to reporting news tions, as well as news and events that directly affect the St. Augustine Beaches community. Second priority will be given to articles of general interest as space permits. Articles or information may be sent to the Beaches News Journal, P.O. Box 51593, Jack sonville Beach, Florida 32240. Information may All articles, news, ads, or other informa tion submitted to editing. Publishing of submitted letters and information is at the discretion of the publisher. Views and opinions expressed are those of the writer and do not express the viewpoint of the publisher or editorial staff of the News Journal. All ads submitted for publication in the Beaches News Journal should be received by the 15th of the month in order to appear in the following months issue. Matters concerning advertising should be referred to the General Manager or mailed to P.O. Box 51593 Jacksonville Beach, FL 32240. The Beaches News Journals acceptance of advertising, articles, advertising, or other infor mation does not constitute endorsement. Nor will the Beaches News Journal and its staff be held liable for information provided herein by submit ters, including websites and/or emails listed, that may have the potential to constitue fraud or other violation of law. The publisher reserves the right to refuse advertising or information that does not meet the publications standards. The Beaches News Journal is published by an any St. Augustine Beach community develop ment, management company or Homeowners Association. City of St. Augustine Beach St. Augustine Beaches News Journal Mayor S. Gary Snodgrass City Manager Max Royle www.staugbch.com City of St. Augustine Beach Danny & Jeanie Carter EWELRY REPAIR J PAYING TOP DOLLAR FOR GOLD COINS & JEWELRY www.cartersjewelry.net 904-471-1023 ROLEX WATCHES & REPAIRS Dedication, hard work and cold cash. See what these have to do with the world of ballet when The Saint Augustine Film Festival presents a special screening of the ballet documentary, First Position. The Center located at 50 Sevilla Street in Saint Augustine. Augustine Ballet. First Position is a feature length documentary about a love of dance all ages and running time is approximately 90 minutes. With unprecedented access to the Youth America Grand Prix, the largest competition that awards full scholarships to top ballet schools, First Position takes audiences on Japan, France, Great Britain, Colombia, Canada and various cities in the United States At a time when art, music and dance for reveals the struggles and success, the pain and extraordinary beauty of an art form so many dancers across the globe are determined to dedicate their lives to. The young dancers in the personal stories as their determination and talent. The director wanted to show a diverse range of economic status and career goals. Visit the balletdocumentary.com. people. If you wish to make a reservation, contact Joy at 904-806-2729. Tickets go on sale at the theatre the day of the show Thursday, June 28, starting at 6:00p.m. and doors open at 6:30p.m. St. Augustine Film Festivals First Person The Florida Department of Environmental Protections Anastasia State Park will be providing a program about birding basics in an outdoor classroom for kids. This exciting 1.5 hour program is intended for kids ages 8-12. The program will begin with an outdoor classroom session on how to identify birds, followed by a scavenger hunt Pavilion and run out to the beach, and back over the boardwalk. The goals of this program are to introduce kids to birding in a fun and educational manner, present birding as one of many ways kids can interact with nature and instill an overall appreciation of our natural Anastasia State Parks goal is to provide access for people of all abilities. If you have any special needs, please contact park staff at (904) 461-2033 before your arrival. Accessible org. The programs will take place Sunday July 15 and August 12 from 9:00 10:30 a.m. BIRDING FOR KIDS AT ANASTASIA STATE PARK Anastasia Park to provide an outdoor classroom to children for birding basicsSchool is out, but a dedicated group of local middle school students continued learning about Florida's legislative protocol and procedures as they participated in a mock session at the County Commission Auditorium on Friday, June 8. Guest speaker, County Commissioner Mark Miner, applauded the students and encouraged them to continue taking an active role in local political activities. Sponsored by the YMCA of Florida's First Coast, the Florida Youth in Government program enables students to learn how to write and present bills they would like to see become laws for the state. This student driven national program helps them understand bill format and formulate their arguments in favor of their bill by learning to "debate ideas not people". St. Johns County high school students Brad James and Diana Oum assisted with the Junior Assembly and were among 600 students statewide that experienced Youth in Government in Tallahassee this past February. presiding over the youth Senate, setting up the days agenda, demonstrating the presentation of a mock bill, and assisting the middle school youth with their bills. The sixth through ninth grade youth legislators and their bill topics were: Rohan Bhargava transportation of unsecured animals in pick-up trucks, Samantha Cosme funding for historical preservation and Grant Gregory no daylight savings time for Florida, Shirindi Suresh raising the legal age for marriage to 20, Vineet Doshi the use of tasers in place of lethal weapons for household protection, Nick Hudson annual inspection of motor vehicles, and Anisha Patel, no smoking on public beaches. I really like the formal debate part of Youth in Government. I can see how this Bottom Row (left to right)Grant Gregory, Samantha Cosme, Anisha Patel, Will Colbert, Shirindi Suresh, Nick Hudson, Vineet Doshi and Rohan Bhargava. Top Row Dyal, David Bonaro, Brad James, Peighton Jones, Danielle Smith and Nancy Birchall. Samantha Cosme and Rohan Bhargava look on as middle schooler Nick Hudson interrogates the author of a proposed bill. Youth In Government Students Learn To Be Legislators will help me a lot after I get my law degree, commented Nick Hudson. Samantha Cosme remarked, I learned a lot I didnt know before I started doing my research for my bill about historic preservation. Created to prepare students for responsible leadership in the American democratic process, YMCA Youth in Government gives kids the support and encouragement to discover who they are and what they can achieve. Through the program, students have the opportunity operates all while building leadership skills, The Youth in Government program will start again in September and is open to any student in the 6th-12th grades. For more information call Danielle Smith, YMCA Family Program Director at 904-471-9622 extension 211. St. Augustine Beaches News Journal July 2012 8 Fresh, Local Seafood Prepared the Way You Like it! Breakfast: Saturday & Sunday 7:30am-10:30am Lunch & Dinner: 7 Days 11am-9:00pm Early Bird Specials: M-F 3:30pm-5:30pm St. Augustines Best Casual Oceanfront Restaurant GRILLED, FRIED, STEAMED, BROILED, SAUTEED or BLACKENED (904) 471-8700 45 Cubbedge Rd. Crescent Beach www.southbeachgrill.net Open For BREAKFAST Saturday & Sunday 7:30 a.m. to 10:30 a.m. Join Us For and more! St. Johns County Sheriffs Corner By David Shoar, St. Johns County Sheriff Taste of the Beach Entree winners district regulations. In addition, there were six secondary goals: develop an employee of city-owned parks. During the rest of 2012 and into 2013 and beyond, the commission May, the commission will review the plan, whats been done/not done, and what needs to be added or deleted. So what are we to learn from all these plans: comprehensive, scenic highway, vision, strategic? There may be two basic lessons: First, that planning for small cities (10,000 and and the limited services they provide arent complex. Second, that elected leaders need to be wary of planning consultants whose main work product seems to be pretty pictures: imaginative, fantasy-0based pictures. Yes, I know that consultants must provide a report honest plan that would take into account that the ugly duckling can never be made a swan, but within budgetary and certain other limitations, there may be some reality-based ideas that could improve the ducklings appearance. Thus, of the four plans listed in the above paragraph, I think that the strategic plan is the one with the best chance of providing useful results. Its goals are simply stated, likely that the strategic plan wont have any pretty pictures. Planning (continued from page 5) shave d away after the St. Augustine Inlet was carved in the 1930s, is nearing completion. The effort which commenced in March was expected to conclude by the end of June. However, weather related events including noreasters and storms, such as Beryl, have impeded progress and it now appears that completion of the and tourists are urged to exercise care and caution when visiting the beach during this re-nourishment effort. Ensuring your safety is our number one priority. Message from the Mayor (continued from page 4) Pier Park Splash Park (at Pier Park) east end of 2nd Street, E Street and 2nd Avenue and F Street and 3rd Avenue) stop the erosion along a section of the Citys main drainage canal that goes through Marsh Creek subdivision We value your inputs and ideas for making our City a better community. For all of us, its the place we call home. Best regards, S. Gary Snodgrass Safety education is an important mis sion of your St. Johns County Sheriffs Of ing concern is distracted driving. Although of the automobile, cell phones have greatly increased the number of crashes resulting from one of the three types of distractions affecting your safe driving. First there is visual distraction something that results in your taking your eyes off the road. The second distraction is cognitive taking your mind off the road and lastly there is manual distraction that results in your tak ing your hands off the wheel. In the case of cell phones, placing or receiving a call from your phone while driv option can result in all three of the typical distraction types occurring and increasing the likelihood of being involved in crash. With texting while driving the chances of dent increase 300% according to statistics Safety Administration (NHTSA). The NHTSA statistics are alarming. In 2008 there were 5870 people killed in accidents caused by texting while driving Fatalities in all accidents caused by tex ting drivers in 2009 amounted to 16% of texting while driving has resulted in three states passing laws making it illegal. Fed eral law prohibits texting while driving for operators of commercial vehicles. Last year an effort in the Florida Leg islature to approve a similar ban failed. A comparative study published by a leading sus drunk driving statistics found texting drivers more likely to cause a crash. Many consider the problem of texting while be hind the wheel a greater problem with teen Distracted Driving drivers. A survey by the Pew Research Center last year found that not necessarily true. Forty seven percent of adults said in our area are spearheading a campaign cell phones in any manor while driving. First Coast Hang up I ask all drivers in St. Johns County to follow the practice and help us save lives. There are many other distractions accidents. Among the most common are: looking at an accident or other incident unruly and misbehaving children in the newspapers, or interactive screens such GPS or audio options and retrieving dropped items such as a lit cigarette. At the St. Johns County Sheriffs Of proud that our efforts in deputy training, forcement Challenge. I urge you to help us keep the roadways of St. Johns County 810-6776 and record the location so we may increase our enforcement effort in that area. Also if you witness a someone driving recklessly please call 911 or your local law enforcement agency. I hope this information assists you in your travels. There is much more information available from our website feel free to contact me anytime at my Thank you.